doors are at 7.30pm and the show will be over by 10.30pm please make sure you arrive early. WEDNESDAY sees a welcome return to the mighty OXBOW, jazz infused, Birthday Party style noise, they produce a live show where you never know what might happen, an element which is as exciting as it is scary. 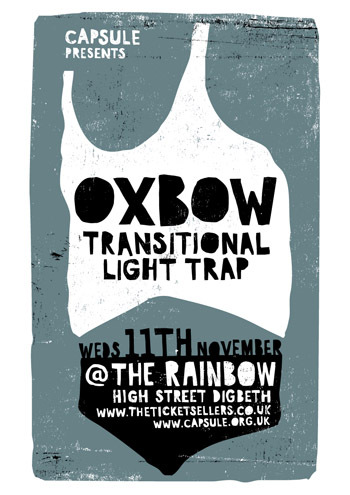 Support for this show comes TRANSITIONAL featuring Dave Cochrane (Head Of David/Grey Machine) and LIGHT TRAP which boasts comprised of John (Haxan, ex Doom & Sore Throat), Doug (Una Corda) and Nic (ex Napalm Death & Scorn).